The automobile sector, as we have witnessed, has made a radical shift in the last decade. Rising economies, liberalization of global trade systems, improved purchasing power in some key countries, has altered the key purpose of automobiles from a “means of commuting” to a “means of committing.” The growing desire of faster access combined with the increased demand of being on time has elevated the need of automobiles in many developed, as well as developing countries. While in one hand, the increased number of vehicles across the globe has made life easier in many instances, in the other hand, it has posed an enormous environmental challenge. Our study on automobiles is primarily based on the patent activity between the years 2010 and 2016. The representation below depicts the global patent activity in the past 20 years. As we see, the momentum in the patenting activity has picked a greater pace in the last decade rising from a steady growth in the decade ago. Here, we have identified the major companies that are actively innovating in our study period (2010 – 2016) in the automobile space. Toyota Motor looks as globally leading the automobile sector followed by Bosch, Honda Motor, Denso, Nissan, Volkswagen Group (Volkswagen, Audi, Porsche), and General Motors. When it comes to patenting technologies in the United States, we saw some variations in the innovation leaderships. Again our study period remains the past 7 years i.e. 2010 – 2016. We found General Motors is leading the innovations in USA leaving Toyota Motors in the second position followed by Honda, Ford and Hyundai in the 3rd, 4th and 5th positions respectively, while Denso stands 6th, and Bosch in the 7th position. 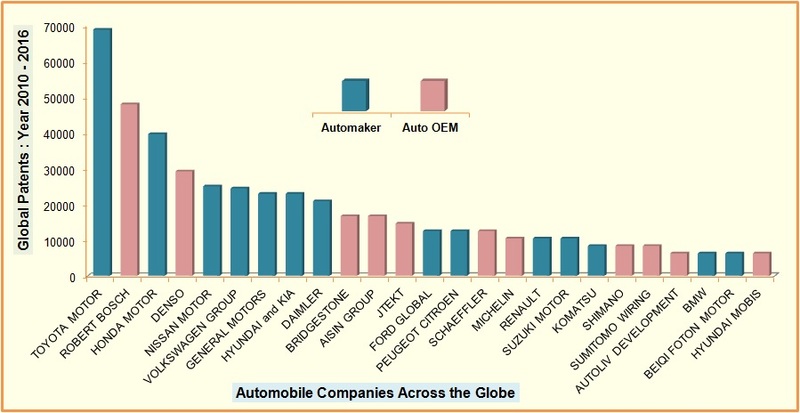 As we saw in the previous analysis of Global and The United States automobiles patent data, it’s quite evident that all the innovators on the top are not automakers; rather some of the leading ones are in fact auto-part makers also called OEMs (Original equipment manufacturers) e.g. Bosch, and Denso. 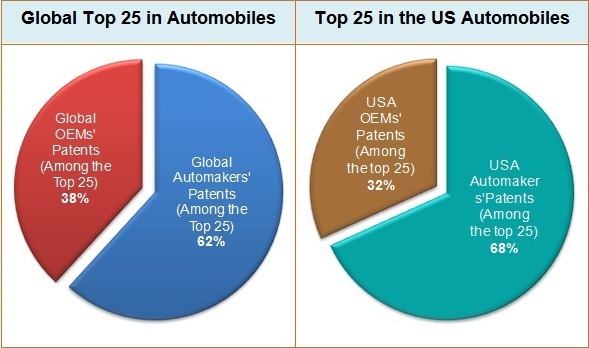 The top 25 companies in the global space and also the top 25 in the USA were separately analyzed to see the ratio of patents filed by the Automakers vs. the OEMs. While in the global scenario the OEMs occupy 38 % of the global patent space, however in USA only 32% patents are held by the OEMs. Does it mean that the 32% are able to cater the need of the 68% automakers in the United States? 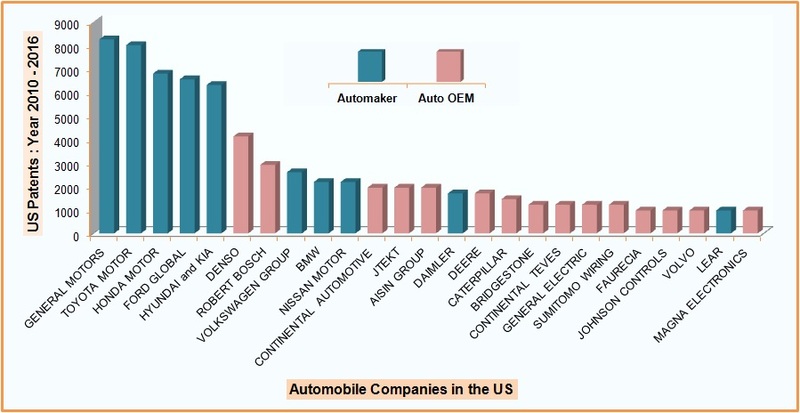 Or US automakers are importing from the OEMs in other countries, who do not appear among the top 25 in the US? A good guess, the later is more appropriate for the reasons of cost advantage!!! As the number of vehicles grew, so were the environmental concerns. 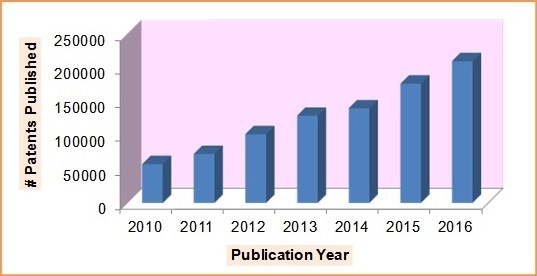 To meet the growing urgencies of keeping the environment safe, research and development in the automobile industry in the past decade especially since year 2010 has gained momentum in devising propulsion systems based on alternate fuel mechanisms, hence giving rise to the Electric vehicles, and Hybrid vehicles as is evident from the study below. 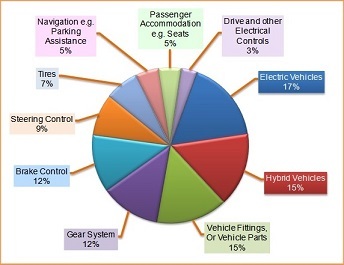 17% of the global patents are focused on Electric vehicles, and 15% on Hybrid vehicles. We made a comparison of the global patent activities in the seven year period i.e. 2010 – 2016 with the previous two seven year spells, i.e. 2003 – 2009, and 1996 – 2002. 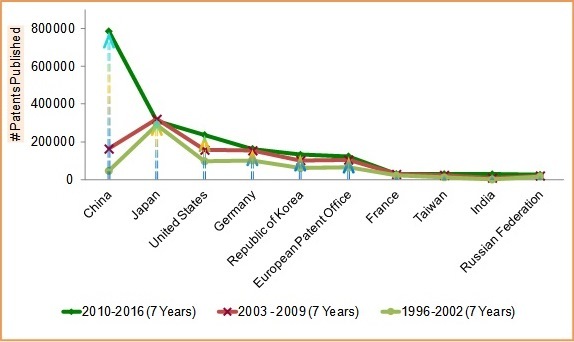 The analysis shows the skyrocketing patent activity in China in the last seven years compared to the other major patenting countries. Whereas, Japan was found to be consistent in the three seven-year slots we analyzed. The data below corroborates the fact that the patenting activity in China has increased significantly. 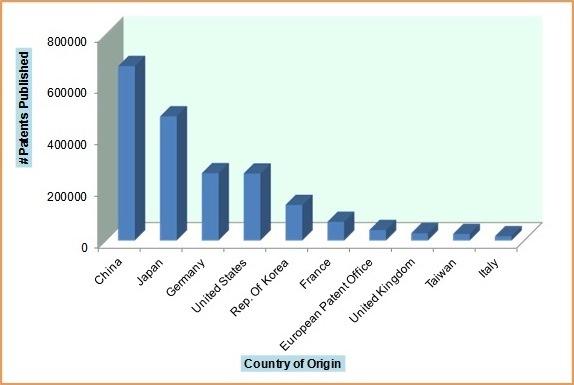 The large volume of patents in China in the period 2010 – 2016, has been originated in China? Yes they were. The global patent space is rising with China registering the largest patent activity. While the patent activity in mitigating the environmental hazards looks to be a conscious effort by the automobile giants, governments across the globe and the individuals (we) at large need to be vigilant enough to make this planet a better place to live than flowing in the stream of senseless comfort and liberty. Above all, we are going to present this earth to our children.